Home/News/New Distributor for Hotel Guest Room Telephones in Russia. New Distributor for Hotel Guest Room Telephones in Russia. After many hours of heavy negotiations, two bottles of vodka and an amazing dinner, Videoluxe in Moscow forces AEI communications to agree to exclusive distributorship for hotel guest room telephones in Russia. Who knew you could smoke a pineapple in Moscow? But seriously, AEi is proud to announce collaboration with Videoluxe, Moscow. This new partnership sees AEi launch its superb range of hotel telephony products in Russia. 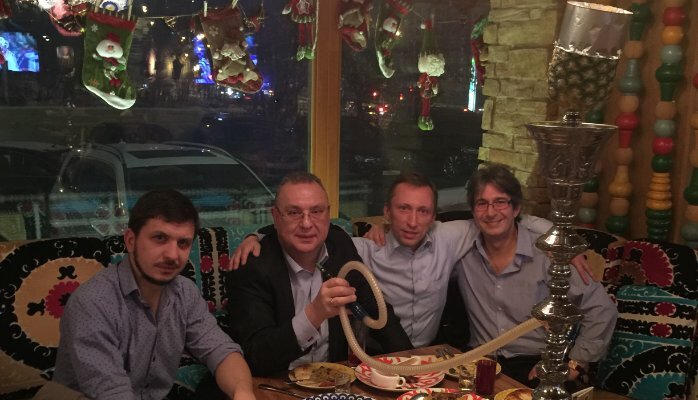 Pictured left to right: Alex Timofeev, Sales Manager; Igor Karmanchuk, General Director; Vasily Baturin, Head of Sales; and me. Please feel free to contact me for LinkedIn introductions and full corporate contact details for Videoluxe in Russia.